This is a draft I wrote in the wake of our pretty girl, Jade leaving us here on Earth. It was so raw, unexpected and hard to push the publish button because our hearts were torn apart. 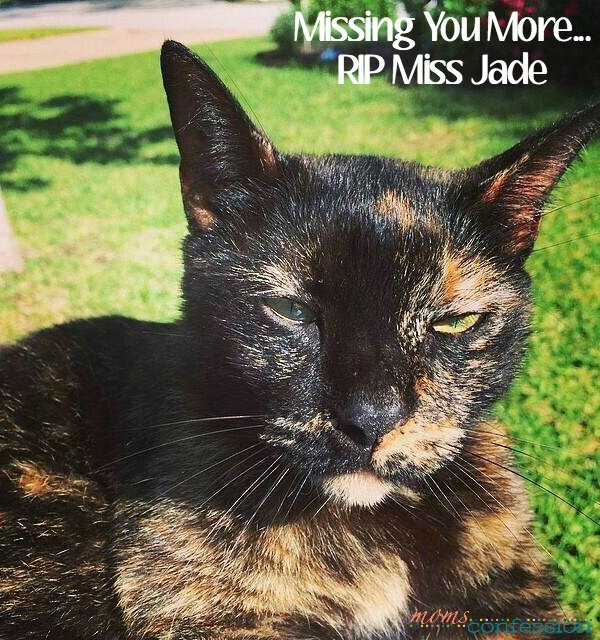 Today, I’m sharing this post with you because I feel that Jade is living on in our hearts to this day and I want you all to feel the love we had for her. The day we rescued you from our tree, we knew you would hold a special place in our hearts. You were furry and cute and had the prettiest green eyes. What I would do to see those green eyes gazing back at me once again. You kneaded my fleece blanket with grace and slept so soundly in our bed. What I would give to feel you kneed the blanket and sleep next to me again. You loved to try and catch our hand under the sheets, and it put a smile on our face. Just the memory of you pouncing on them brings a smile to my face. You loved the boys, and they loved you back. Now their hearts are full of sadness, and it’s breaks mine to see. Their smiles will return when they think of the memories you brought into their lives soon enough. You were Papooh’s (my dad) night owl buddy…always making sure that he felt your love. Even if you climbed on the keyboard or the back of his chair to get his attention. What he would give to have you jump on the keyboard just one more time. Our hearts have been broken over the past six months since you left us, but we all know that you in a much happier place and the pain you felt that fateful weekend is gone. I held you ’til the end. I told you go, be free and said my last goodbye. I cried my eyes and wished your pain would just go away. I watched you take your last breath on earth, and I hope you felt my love. The moment you left our family will be forever etched in my mind, but I know you are free and happy now. Your memory will forever be engraved in our hearts, and you will be missed forever. We all love you Miss Jade…live happy and free forever, beautiful girl.